Native to South America, toucans inhabit a range of habitats including tropical forests, savannas, and shrub-land. Toucans nest in the hollows of trees. They often move into cavities created and abandoned by woodpeckers. Toucans live in flocks made up of approximately five to six birds. 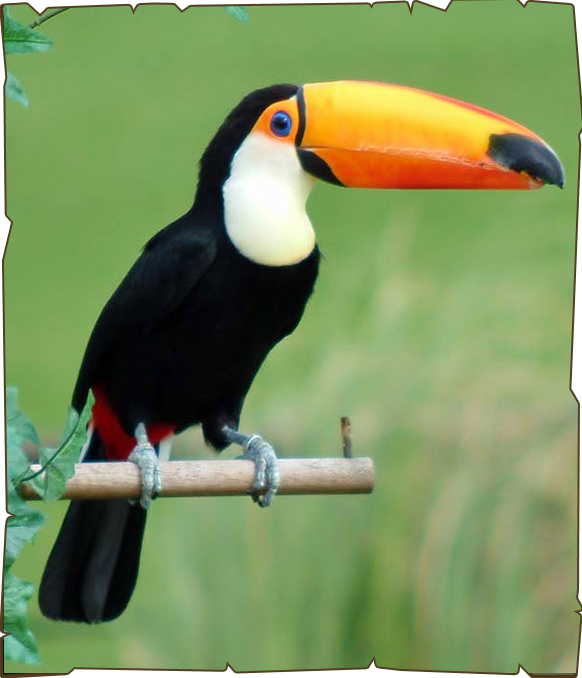 Toucans are omnivorous (eat both plants and animals). Their main food source is fruit, which is plentiful in the rainforest trees where they live. They also consume eggs, insects, reptiles, small animals, and nuts. The toucan has small wings that do not allow it to fly very far. This is not a problem for the Toucan because it does not need to travel far. It hops around the rainforest trees and may fly very short distances to obtain food.